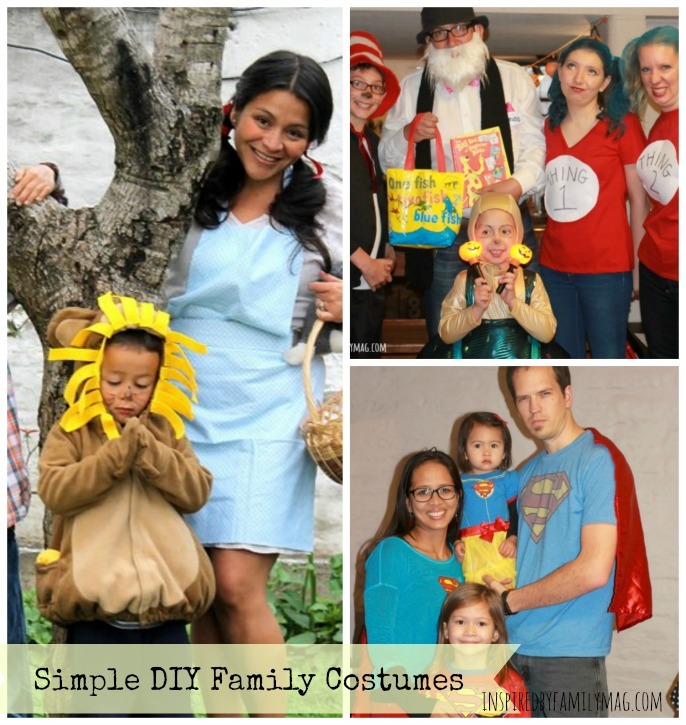 You are at the right place if you’re looking for Simple DIY Family Halloween Costumes! Most of these costumes were whipped up by friends of ours who used simple things from around the house, glue and construction paper. Others mixed in purchased accessories with homemade. Our family likes to dress up for Halloween and celebrate the fun and creativity of this holiday! This picture below may look like Halloween but it’s not, it’s just another day of the year at the Tuten home. My kids dress up and play pretend all year long! As I type my oldest is walking out the door with a pirate hat, darth vader cape and Nerf gun in his hand. Here’s another picture of my boys now that they are older. Our dog Milly had to be included in this picture. For Halloween we try to stick with the fun and non-scary costumes. 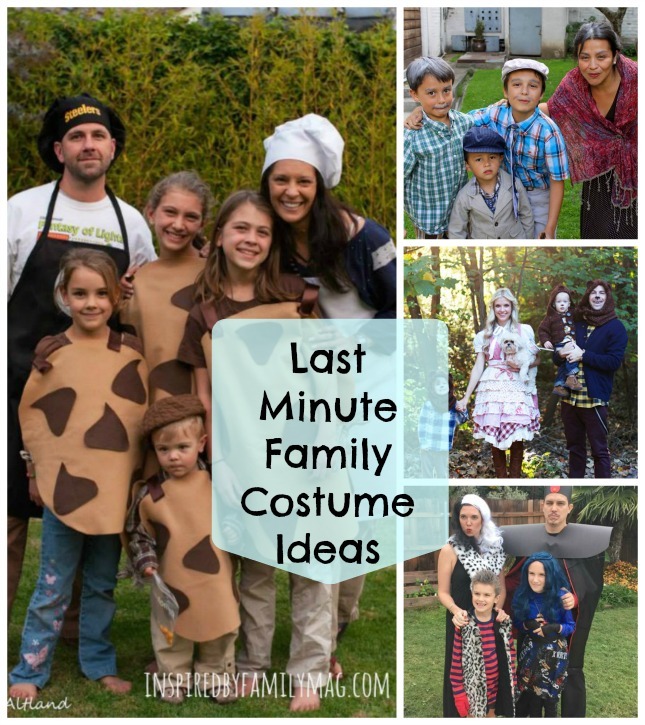 Here are some kid-friendly and family-friendly costume ideas your family can whip up, last minute. This one is really cute-bakers and cookies costume! You can totally whip this costume up without having to sew anything. Just use some good glue, grab some brown felt and baker hats and aprons. Viking Family & dragon aka Toothless- This was our family costume last year. This was also a no sew costume. Go here for the tutorial on how to make this costume. Little House on the Prairie family with cute little puppy! This is a friends costume idea from a couple of years ago. This one would require some white aprons and bonnets but the skirt and shirt can be something from your closet or a thrift store find. The Descendants Family! I love how creative my friend got with this awesome Disney family costume. Go to the fabric store and buy some faux fur it’s not expensive if you’re only buying a small amount. Wigs for the girls and for the rest of your costumes you’ll need to rummage through your closet oh and pasteboard always does the trick. Here’s a fun dad and daughter duo–nerd and baseball player! This was our costume a few years ago–Star Wars! These costumes were so fun and they were no-sew–Luke, Princess Leah and Boba Fett. It was just a matter of rummaging through fabric pieces to pull it together and using some strong fabric glue but as you can see Darth Vader was a store bought costume that we found in their pretend play box. Where’s Waldo family! Love it, get the details here. Here we have Little Red Riding Hood and Waldo! This one is an old friends costume! On the right is my friend and I’m on the left. Her costume was fabulous. If you plan on doing this make sure to look at the details of her costume. She won best costume! And of course you can be an old family!We used baby powder for our gray hair. And for our old tourist couple costume idea go here. The Royal Family costume is awesome!For costume details go here. We don’t always dress up with the same theme in our family. One year we had ninja boys and we were Vikings. There costume is also no-sew. We used black t-shirts for the head wrap. Black shirt and pants for the costume and red felt for the robe and red ribbon around their waist and arms. Here I pulled another no-sew costume together. Wizard of Oz team! The Lion was a store bought monkey costume from years ago that was turned into a lion by adding yellow felt strips around the hood. You can totally do this with a brown hoody jacket. The scare crow was simple and I show you HERE how to make the no-sew apron for Dorothy’s costume. This is a fun one! A friend of ours made this with her son. This Minecraft costume was put together using boxes, paint and glue. You always need a super family! Artist Family–My friend came up with this awesome costume for herself and though it’s not a family theme you can certainly have a family of artist or art inspired costumes. Andy Warhol you can find the details here. This Picasso inspired costume. Get the details here. You just need a paper bag for this–easy enough! I love how simple and creative this one is. A blogging friend came up with this Smore’s idea. Get details here. My friend came up with this one. Perry the Playtupus–so fun! She used his long pi’s, a hat and an orange pice of construction paper! Peter Pan and the Lost Boys family! Get details here. This costume seems hard but it’s a matter of putting together accessories and the rest is things from your closet. Get details here and I have a tutorial for a no-sew Peter pan costume here. This was such a fun theme for a family–Dr. Seuss Family. You can’t see the whole fish costume but our little friend in the middle is dressed up as a fish. Perfect! And I’ll end this collection with another children’s book favorite–Goldilocks and the three bears. Another easy one you can pull off with bear ear headbands and brown clothes. Go HERE are some fabulous costume ideas for couples.